Made in Australia from at least 53% Australian Ingredients. Ingredients: Oats, Organic Brown Rice Syrup, Sweetened Diced Cranberries (5%) (Cranberries, Sugar, Sunflower Oil), Concentrated Sour Cherry Juice (4%), Coconut Oil, Natural Flavour. May contain traces of Peanuts, Tree Nuts, Sesame Seeds, Milk and Soy. During exercise:Consume one bar every 30 minutes with fluid to prevent energy loss. 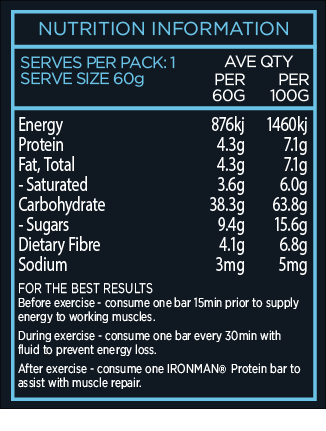 After exercise:Consume one IRONMAN® Protein bar to assist with muscle repair.